Among the things that (education) technology is supposed to revolutionize: memory. Memory in computers is not wholly analogous to memory in humans, of course, despite using that same word to describe what we are increasingly coming to think of as a process of information storage and retrieval. Human memory is partial, filtered, contextual, malleable; computer memory is fixed (we hope – until the machinery fails, at least). You store written text about and photos from your vacation on your hard drive, and these will never change; as long as that drive functions and the file format persists, the story of your vacation will remain accessible. Human memory is different. The story – the memory – will change over time. It can be embellished; it can be forgotten. We forget by design. Now (purportedly) the machine can remember for you. As educational practices have long involved memorization (along with its kin, recitation), changes to memory – that is, off-loading this functionality to machines – could, some argue, change how and what we learn, how and what we must recall in the process. Bush’s essay and his vision for the Memex influenced both Douglas Englebart (see his 1962 article “Augmenting Human Intellect: A Conceptual Framework”) and Ted Nelson (the Memex, with its associative linking, is often cited as a precursor to hypertext). 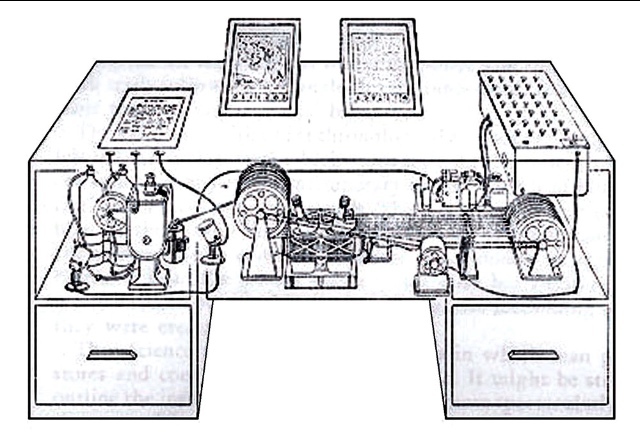 While it sparked the imagination of Englebart and Nelson, the idea of the Memex seems to have had little effect on the direction that education technology has taken. (It is in retrospect one of those forks in the history of computing that, as Bret Victor has pointed out, people failed to take.) Indeed, the development of teaching machines, during and after WWII, was far less concerned with an “augmented intellect” than with enhanced instruction. The bulk of the CAI projects during the 1960s and 1970s were directly descended from Skinnerian teaching machines and reflected a behaviorist orientation. The typical CAI presentation modes known as drill-and-practice and tutorial were characterized by a strong degree of author control rather than learner control. The student was asked to make simple responses, fill in the blanks, choose among a restricted set of alternatives, or supply a missing word or phrase. If the response was wrong, the machine would assume control, flash the word “wrong,” and generate another problem. If the response was correct, additional material would be presented. The function of the computer was to present increasingly difficult material and provide reinforcement for correct responses. The program was very much in control and the student had little flexibility. The Memex could be seen as an antecedent to more recent efforts like “Domain of One’s Own,” “lifebits” and “hosted lifebits,” and IndieWebCamp, where the shape and control of technology is both individualized and decentralized. That means that one should ask, of course, who would actually control the Memex. Is the software and the hardware (or in Bush’s terms, the material and the desk) owned and managed and understood by each individual or is it simply licensed and managed by another engineer, company, school, or organization? Who has access to our learning/memories?